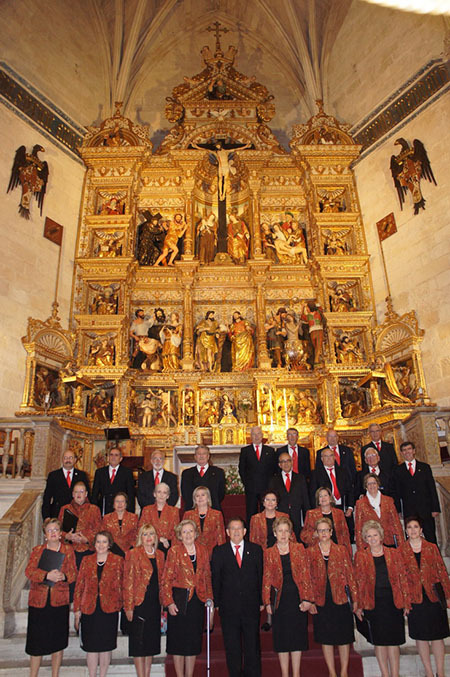 EL CORO “SAN ALFONSO” DE LOS ANTIGUOS ALUMNOS REDENTORISTAS DEL SEMINARIO DE SANTAFÉ INTERPRETÓ AYER, DÍA 17 DE MAYO DE 2.013, EL CONCIERTO MARIANO, PROGRAMADO PARA ESTE MES. EL CONCIERTO EMPEZÓ PUNTUALMENTE A LAS OCHO Y MEDIA. D. MIGUEL LUIS LÓPEZ – GUADALUPE, COMISARIO GENERAL PARA LA CELEBRACIÓN DEL AÑO SANTO JUBILAR DEL PRIMER CENTENARIO DE LA CORONACIÓN CANÓNICA DE LA SANTÍSIMA VIRGEN DE LAS ANGUSTIAS, EN NOMBRE DE SU HERMANDAD SACRAMENTAL, HIZO LA PRESENTACIÓN. CON SU VERBO FÁCIL, AGRADABLE Y PRECISO, EXPRESÓ SU SATISFACCIÓN POR CELEBRAR ESTE CONCIERTO MARIANO, CORRESPONDIENTE AL MES DE MAYO Y EN VÍSPERAS DE LA MAGNA PEREGRINACIÓN MARIANA, EN UN LUGAR TAN CARGADO DE HISTORIA Y DE TANTO SIGNIFICADO PARA LOS GRANADINOS, COMO ES LA CAPILLA REAL, MAUSOLEO DE LOS REYES CATÓLICOS, ARTÍFICES DE LA UNIDAD DE ESPAÑA Y ELLOS FUERON LOS QUE TRAJERON A GRANADA LA DEVOCIÓN A LA STMA. VIRGEN DE LAS ANGUSTIAS. AGRADECIÓ, VÍVAMENTE AL CORO SAN ALFONSO SU DISPONIBILIDAD PARA COLABORAR CON LA HERMANDAD Y CON LA BASÍLICA DE LA VIRGEN. RESALTÓ QUE EL PROGRAMA DE ESTE CONCIERTO ES NETAMENTE MARIANO, PUES TODAS LAS PIEZAS SE REFIEREN A LA VIRGEN MARÍA, MEZCLANDO DISTINTOS ESTILOS: GREGORIANO, POPULAR Y DE DIFERENTES ÉPOCAS MUSICALES. 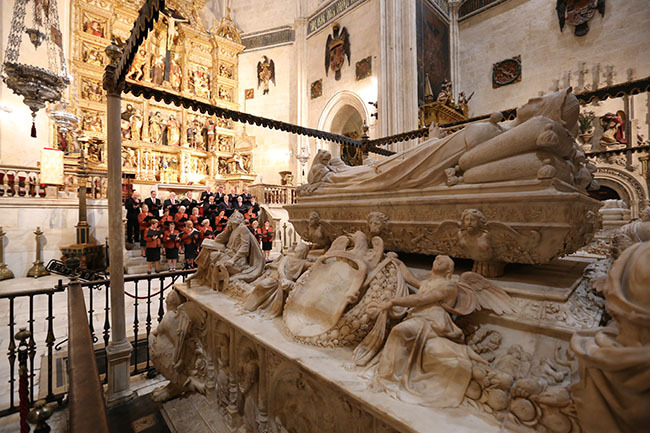 TAMBIÉN HIZO HINCAPIÉ EN QUE EL CORO TIENE COMO PATRONA A LA VIRGEN DEL PERPETUO SOCORRO, QUE FUE TAMBIÉN UNA DE LAS PRIMERAS QUE FUE CORONADA Y A LA QUE MUCHÍSIMOS GRANADINOS PROFESAN UNA GRAN DEVOCIÓN Y RECURREN A ELLA EN SUS NECESIDADES. AGRADECIÓ A TODOS LOS PRESENTES SU ASISTENCIA A PESAR DEL MAL TIEMPO REINANTE EN GRANADA. EL CORO SAN ALFONSO TIENE YA UN HISTORIAL DE 16 AÑOS. FUE FUNDADO POR D. ANTONIO DIONISIO LÓPEZ, ANTIGUO ALUMNO REDENTORISTA, Y NACIÓ DE LA MAGNÍFICA RELACIÓN DE AMISTAD Y HERMANDAD, QUE EXISTE ENTRE LOS COMPONENTES DE LA ASOCIACIÓN DE ANTIGUOS ALUMNOS, QUE SE DILATA EN EL TIEMPO DESDE LOS PRIMEROS AÑOS DEL SEMINARIO REDENTORISTA DE SANTAFÉ, ALLÁ POR LOS AÑOS CINCUENTA, DE LA MAYOR PARTE DE SUS COMPONENTES. 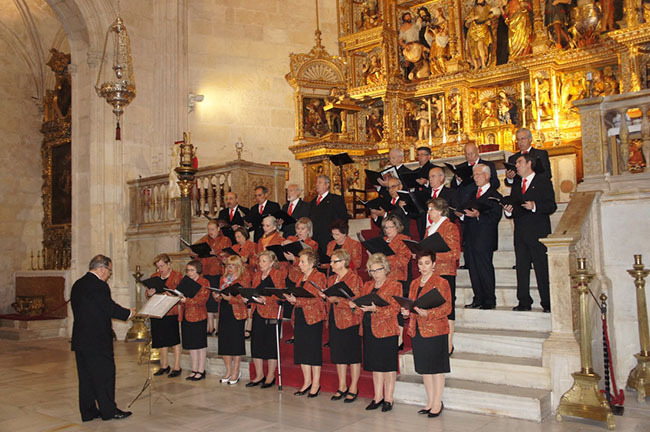 EL CORO, DIRIGIDO ACTUALMENTE POR D. MODESTO TAPIA AGUILERA, ANTIGUO ALUMNO TAMBIÉN, HA ACTUADO EN NUMEROSAS IGLESIAS DE GRANADA, EN LA CATEDRAL Y EN DIVERSAS PROVINCIAS, ASÍ COMO EN LA CATEDRAL DE GIBRALTAR. LA CLIMATOLOGÍA NO AYUDÓ A LA ASISTENCIA AL CONCIERTO, YA QUE UNA HORA ANTES DE SU COMIENZO DILUVIABA EN GRANADA, SIN EMBARGO HUBO UNA ASISTENCIA MÁS QUE NOTABLE DE PERSONAS QUE SIGUIERON EL CONCIERTO CON MUCHO SILENCIO, RESPETO Y ATENCIÓN, DISFRUTANDO, ESPIRITUALMENTE, DEL MISMO. TODAS LAS OBRAS, HAN SIDO INTERPRETADAS POR EL CORO CON UNA GRAN AFINACIÓN Y GUSTO MUSICAL, CUIDANDO LOS MATICES DE LAS DIFERENTES CANCIONES, DANDO A CADA UNA DE ELLAS SU IMPRONTA Y CARÁCTER. 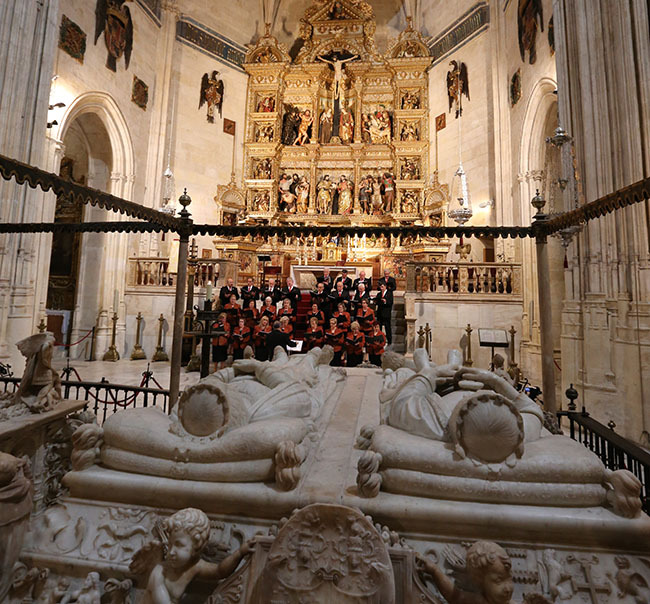 CABE DESTACAR LA INTERPRETACIÓN DEL CANTO GREGORIANO POR BAJOS Y TENORES, REALMENTE SE PALPABA EN EL AMBIENTE LA ESPIRITUALIDAD QUE TRANSMITE LA CAPILLA REAL. TANTO D. MANUEL REYES, CAPELLÁN MAYOR DE LA CAPILLA REAL, COMO TODOS LOS EMPLEADOS HAN COLABORADO PARA QUE ESTE CONCIERTO SE HAYA PODIDO CELEBRAR CON ESPLENDOR Y REALCE. AL FINALIZAR EL CONCIERTO MUCHAS PERSONAS MANIFESTARON SU ALEGRÍA DE HABER PODIDO DISFRUTAR DE ESTE MAGNÍFICO CONCIERTO.